John and I lived at Kibbutz Adamit, then Kibbutz Shoval in late 1990, and were living at Kibbutz Dan when Operation Desert Storm blew in. "I was living at Kibbutz Shoval in Israel’s Negev desert, beautifying the grounds, when I heard that [Meir Kahane] had been murdered in New York by another Arab terrorist. When his funeral took place in Jerusalem, I was honored to attend with tens of thousands of others to show solidarity with what he boldly taught— and as a blond, stood out in the Black Sea of Haredim on TV." "Shoval, a rose in the Negev desert, just north of Be'er Sheva..."
I remember when we stayed at Shoval, how rumors of war with Iraq had us concerned, and how this older kibbutznik man said, "There won't be war. The Iraqis know we're not like the Americans," implying the Israelis would hit back hard and fast. I thought of him later when we lived at Kibbutz Dan and war did break out and we were all huddled in our "sealed rooms" whenever the sirens went off, warning about incoming Scud missiles, taking shelter until the "all clear" was sounded (which we usually heard on the radio from the BBC first!). We mentioned our concerns to the volunteer leader at Shoval, and she said something like, "If you're really worried about it, we can get you a gas mask" - with the tone that we were bothering her. After all, there had been notices in The Jerusalem Post about the Israelis obtaining their gas masks in case of war. Here are a few pictures of Kibbutz Shoval volunteers, John's birthday, kibbutzniks, new Russian immigrants (from Tashkent, who gave me a traditional hat worn there), Ashdod, museum/former mosque in Beersheva, couple of Jerusalem, our volunteer trip to Ein Gedi (with Arugot Nahal waterfalls and Ibex) and the Dead Sea. Enjoy! Pictures of Kibbutz Reshafim volunteers! I also have many lovely photos I'm eager to share & will share as soon as I am able. Our friendship was/is a gift. I'm so glad to have reconnected w/u. I'm tempted to say next year in Jerusalem or NY. I have been getting nostalgic in the past year and usually google Sdot-Yam. I see your name everywhere and I just smile. I loved seeing the pictures, and just remembering that part of my life does me good. I have been in search of Anja Zerwas for many years now, just seeing her picture on your website has renewed some hope that I may still find her. I miss Donna as well, she was always good to talk with when things were rather dismal, do you hear from her at all? There is a website called KibbutzReloaded.com, it's for volunteers and ulpan students. I was surprised not to see your name and story on the list. 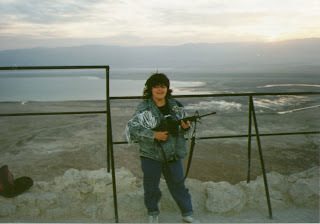 I saw the picture you had of me on top of Masada with the machine gun, I have that picture on my fridge. I have to say what shocked me most about you was your brilliant writing ability, and here I thought you were just another pretty face. I had no idea you are such a deep thinker. I look forward to getting out to the bookstore and buying it. You could say I have a God-given love for the Jews and the nation of Israel (Isaiah 62:6-7). That sacred bond has been strengthened over the years by the fact that I've been blessed to have lived all over Israel, getting to know its land and people quite well. 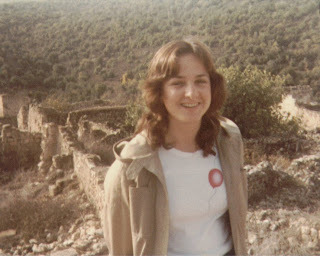 Apart from 5 months at Ramat Yohanan (where I met my "kibbutz mother," Miriam Weiss) I've also stayed at Sdot Yam on the Mediterranean, next to Caesarea, the site of my first ulpan (intensive Hebrew course), and where Israel's heroine, Hannah Senesh, was from; Regavim, near Zichron Yaakov, where I continued my Hebrew lessons amid its rolling green hills; Reshafim, near Bet She'an, with Mt. Gilboa practically in our backyard, and Jordan's mountains in lovely view out front; Adamit, on Lebanon's border, high up on a mountain, from where on clear days you can see all the way to Haifa's Mt. Carmel; Shoval, a rose in the Negev desert, just north of Be'er Sheva; Dan, way up in the northernmost part of Israel, in between Syria and Lebanon, next to the majestic snow-covered Mt. Hermon, where I was living when "Operation Desert Storm" blew in; and Ha'On, with its campground and ostrich farm on the eastern shores of the Sea of Galilee, across from Tiberias; and last but not least, my beloved Jerusalem, next to my favorite spot on earth: the Temple Mount. Well one thing is for sure, there are those of us that wish that you would end your racist posting. LOL. That's for damn sure!